Archive and play back your MP3s on media that will outlive your computer. Whatever your CD-burning needs, the TASCAM CD-RW900SL CD Recorder features a robust slot-loading transport, 24 bit A/D & D/A converters, MP3 playback, key control, sample rate conversion, and selectable CD disc reading speed. 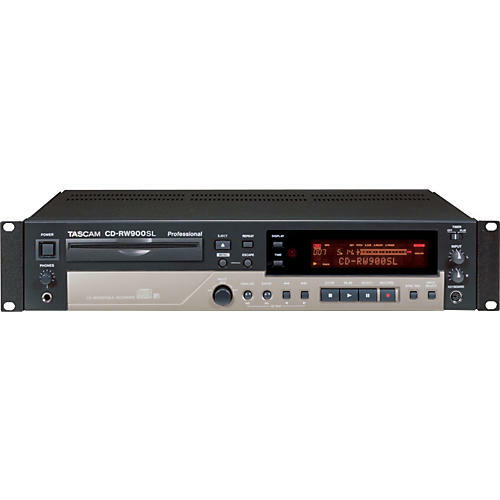 The CD-RW900SL recorder provides dedicated analog front panel input control, rear panel unbalanced (RCA) I/O, and S/DIFF digital I/O (optical and coaxial). Recently added features include Auto Cue and Auto Ready from the menu, selectable I/R remote Enable/Disable, and MP3 Action Setting (prevents accidental termination of continuous MP3 playback). Order with the protection of our 45-day total satisfaction and lowest price guarantees.